A revolutionary new general purpose computer processor called TRIPS (Tera-op, Reliable, Intelligently adaptive Processing System) has been announced by scientists at The University of Texas at Austin. The new processor has the potential of achieving trillions of calculations per second. That's one processor, not the hundreds or thousands used in today's supercomputers. "The TRIPS prototype is the first on a roadmap that will lead to ultra-powerful, flexible processors implemented in nanoscale technologies," said Burger, associate professor of computer sciences. 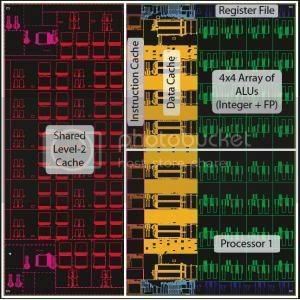 The TRIPS processor relies on a new class of processing architectures called Explicit Data Graph Execution (EDGE) which, unlike conventional processors that process one instruction at a time, can process large blocks of instructions at once. Current "multicore" processing technologies increase speed by adding more processors, which individually may not be any faster than previous processors. Adding processors shifts the burden of obtaining better performance to software programmers, who must assume the difficult task of rewriting their code to run well on a potentially large number of processors. "EDGE technology offers an alternative approach when the race to multicore runs out of steam," said Keckler, associate professor of computer sciences. Each TRIPS chip contains two processing cores, each of which can issue 16 operations per cycle with up to 1,024 instructions in flight simultaneously. Current high-performance processors are typically designed to sustain a maximum execution rate of four operations per cycle. This development demonstrates the historical experience of technological evolution: When a paradigm begins to reach its limits for further development, a new paradigm takes its place. Moore's law is safe. Stay tuned.